A Wow of a Weekend! Not many opportunities come to where I can take full advantage of staying completely home all weekend long. I always try and make it to church, but with two littles at the beginning of colds and one needing breathing treatments I really didn’t want to chance anything with spreading our ickies to any other little kids in the church nursery. Work is demanding, kids are demanding, getting in the car numerous times a day is plain exhausting some times and once in a GREAT while I’d love to grace the blessing of not having to leave the house…PERIOD!!! 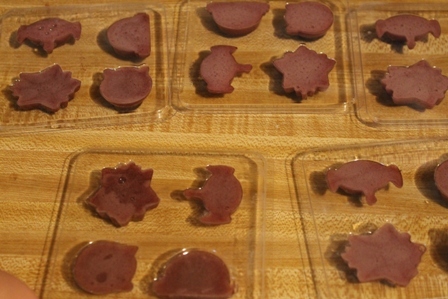 Next on the to do list included homemade fruit gummies. My boys LOVE these treats, and what better way than to make them at home – people think homemade and often lean towards time intensive methods and rigorous moves that they may not be up for. That’s simply NOT the case with all homemade items. Be brave and take a chance – and how cool that you can involve your kids in the process and make it a learning op for them – not to mention FUN! 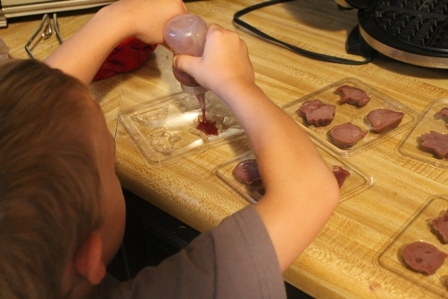 Mixing a few packs of unflavored gelatin, some fruit juice – heating it and pouring into a mold – how easy is that? I just might add you can’t always find TOY STORY gummies in the grocery store. So I guess we’re kind of special huh? JUST kidding!!! 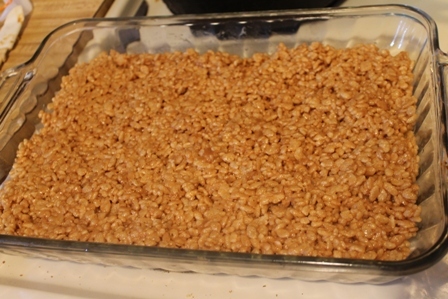 And can’t forget the trusty Rice Krispy Treats!! This batch was made with peanut butter. I then rested with my babes for a bit and let everything camp out in the kitchen for a while. My mom gave me a bag of red potatoes from their garden, along with bell peppers and jalapenos (thanks mom! ), and a few squash and eggplant. We tore up the eggplant already and some of the squash so I only had a small amount to take to the freezer. I LOVE to do things in the kitchen. Create, preserve, dehydrate, puree, bake, you name it and I’ll give it a try! One activity I enjoy is dehydrating items. 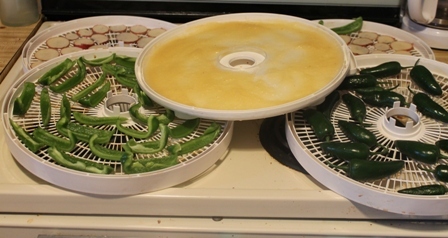 I cut up the bell peppers, which can be used as pepper flakes if you process them after drying, or you can leave them cut and dried and just use in dishes as you need them. How sweet is that? No buying, straight from the ground and into your home! God is SO good with the earth and resources he gave us. I dried the jalapenos whole, and I sliced potatoes to be used as scalloped potatoes or just an addition to a soup base for later. I did try powdering a bit of the dried potatoes and will soon experiment to see how it works with making a mock instant potatoes. I have NO idea but I’m not afraid of it becoming a flop either…and if it works..what a glorious day! The last fun creation was applesauce fruit leather. 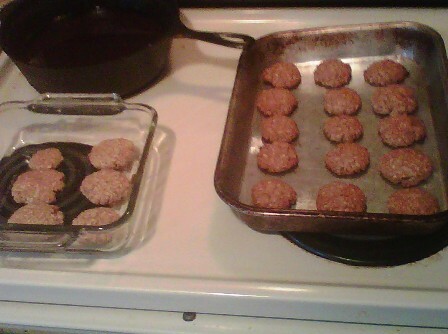 It’s SO easy and quick just to pour the applesauce on the tray and let it dry. Even better if you make your applesauce but my boy and I did cheat and use the jarred! 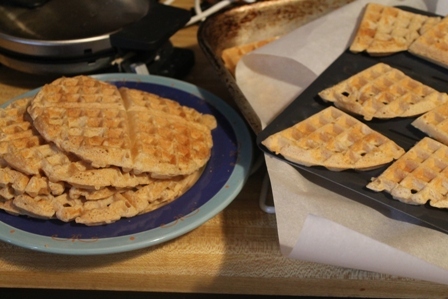 This is too cool: I put them in the food processor after they were fully dehydrated. Will see soon how they work after cooking them. 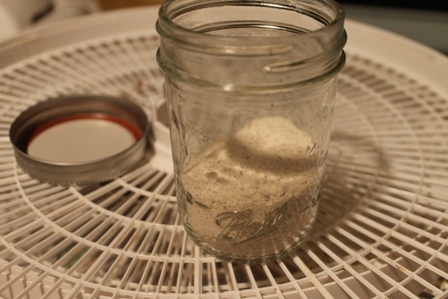 Next is a photo of the dried bell peppers, the fruit leather, and surprise – homemade bread. I worked on the bread the next morning. Things smelled SO good at my house. Yes you have full permission to be jealous! I suggest everyone having a breadmaker…It’s so easy, quick and healthy to make your own bread. Really, just dump flour , water, yeast, salt, sugar and whatever else the recipe you are using calls for. Turn the machine on and let it work its magic!!! I’m not kidding! Let it do the work while YOU go enjoy yourself. I’ve used several different recipes before and loved them all! I blanched two quarts of potatoes, two and a half quarts of green beans with little potatoes in them, and two quarts of mixed squash and zucchini. Did I mention I got LOTS of rest and snuggles with my little superheros? Despite being under the weather we still make time for good sugars!! Much of this molly homemaker activity is a do and go rest, do and go do something else – I’m not really BOUND to the kitchen (except if I were canning or something on the stove). I tended to the little basil plants. They were getting too big for their containers so I spread them out into five containers now. Speaking of containers…I LOVE container gardening. But more on that in a separate post! Thanks for walking to my corner and seeing a little of what I enjoy doing outside of my day job.